​​​​​​​​BROWNSVILLE - Summertime is behind us, but for buyers who can't get enough sun, buying a permanent (or vacation) home in a beach town could be a ticket to year-round summer living. There are a handful of coastal towns with price tags too good for buyers to walk away from, and expanding to those areas could be a smart move for builders as well. Using median new home price data from Metrostudy during 2Q 2016 Hanley Wood Data Studio pinpointed affordable and livable beach towns that are within reach of first-time or entry-level buyers. To narrow the pool, Hanley Wood Data Studio​ combed data from every coastal state and selected MSAs only by the sea. 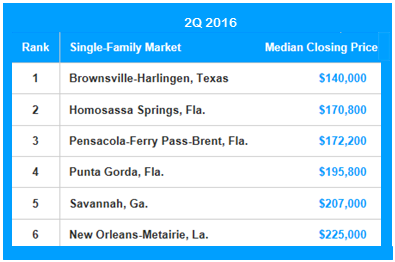 The most affordable market on their list—Brownsville-Harlingen. Located close to the border and the Gulf of Mexico, Brownsville-Harlingen's median price for a new, single-family home is $140,000.